The following are on view at the gallery. Click for larger image. 'Coral Sea', 2018, polychrome ceramic, 20x30x13"
'Small of My Back', 2018, polychrome ceramic, 11x19x31"
'Can't Explain', 2018, polychrome ceramic, 21x9x21"
'Sisiter', 2018, polychrome ceramic, 18x18x20"
'This Is', 2018, polychrome ceramic, 25x11x10"
'Baby', 2018, polychrome ceramic, 5x11x21"
'Blue Distance', 2018, polychrome ceramic, 8x8x18"
'Immersion #15', 2013, polychrome ceramic, 83x31x43"
'Coup d'Oeil #3', 2013, polychrome ceramic, 71x28x21"
'Coup d'Oeil #5', 2013, polychrome ceramic, 70x21x17"
Kathy Venter was born in South Africa where she received her M.F.A. in Sculpture, Port Elizabeth School of Art and Design and immigrated to Canada in 1989. She builds her life size ceramic sculptures by hand using the extended pinch method - similar to large vessel building. No molds are used as the hollow, completed wet clay sculptures are 15% larger than life size to shrink to the desired scale after firing. 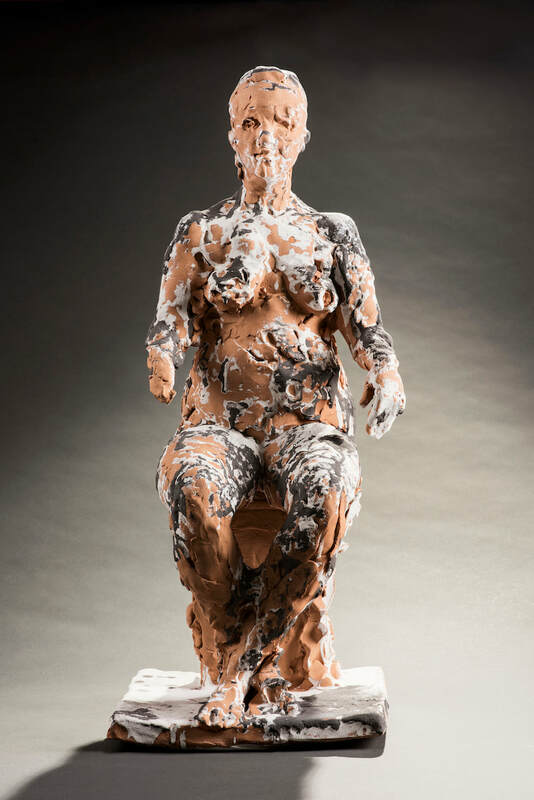 An exhibition of 36 of her sculptures originated at the Gardiner Museum, Toronto from 30th May 2013 to 15th September 2013. This exhibition travelled to the Bellevue Arts Museum, Wa., U.S.A. in 2014; Sacramento State University; Deuthebank/Circa Museum, Johannesburg, South Africa; and IMA, San Juan Islands, Wa., USA. Part of this exhibition will be shown at the Vancouver International Sculpture Biennale 2014-2015. Kathy currently lives and works on Salt Spring Island, British Columbia, with her husband, painter Deon Venter. To see Kathy's full CV and Exhibition record, please click here. Click here to watch a video interview with Kathy. Visit Kathy Venter's website for further images of her work and info. From the Ground Up, an interview with John K. Grande, guest curator for Kathy's Gardiner Museum exhibition 'Life'. JKG The great beauty of sculpture is that it can engage us in the space we live in. It also captures time future and time past in the present. Can you tell me what drew you to work in three dimensions initially? KV A love of sculpture and an inherent ability to do it. They were both just there. 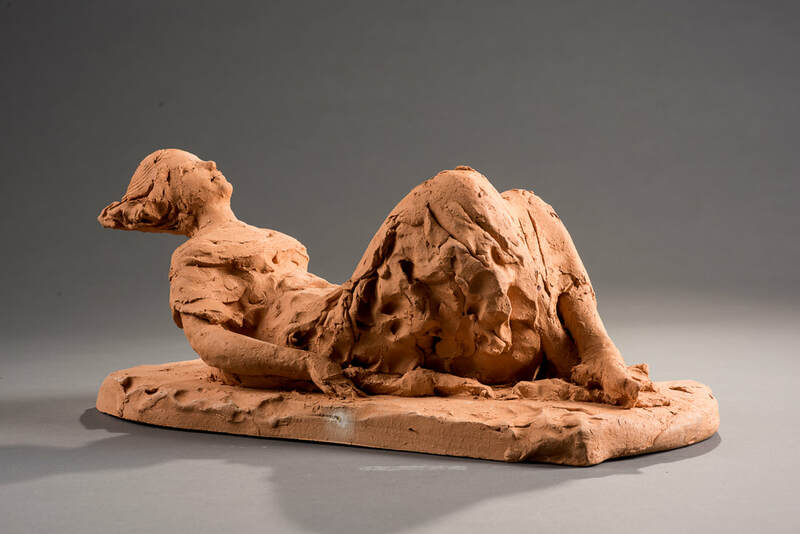 KV Yes — I build my sculptures from the ground up in a simple extended pinch method — in the manner of building a vessel — which I adapted to suit the specific challenges of creating figurative life-size works. 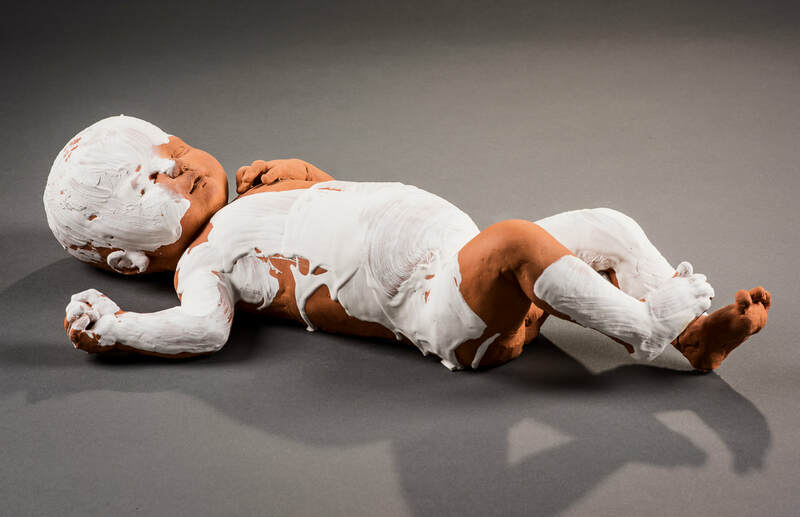 Unlike George Segal, Duane hanson, or Manuel Neri, I don’t make use of any life casts, moulds into or over, or modelling over an armature. As I work exclusively in clay, which has to be fired, I build my figures up to 15 per cent larger than the model so they can shrink to life size after drying and firing. I have a respect for the basic fundamentals of craft existing in the sculpture of all societies. The argument of art versus craft has traditionally had very little relevance in most societies and I believe that this argument has run its course in the contemporary debate. We have to remember that the word “art” comes from the Greek “ars,” which means craft. So during a period of high art, the best craftsmen were valued. JKG In fact, your sculpture, because of the medium, consistently straddles what could be considered craft and what could be considered fine art.